Yellow squash also referred to as summer squash or yellow zucchini, which is a vegetable that measures up to 8 inches long depending on when you pick it. It is normally picked before maturity when the skin is thin and edible, and the flesh is soft and sweet. You can eat yellow squash raw, baked, stir fried, sautéed or grilled. It can be a substitute for any green summer squash as it has the same taste. If you’re wondering about the amount of calories in yellow squash, read on to find it. There are very few calories in yellow squash. This is largely because it is a vegetable. Below is a breakdown of the number of yellow squash calories present in various serving sizes. The soft shell, creamy white flesh and delicate flavor of the yellow squash are the perfect addition to a meal. Apart from the few calories in yellow squash, it also provides a plethora of nutrients necessary for optimum body function. The amount of vitamin A can meet the need of 8% daily value. The amount of vitamin B6 can meet the need of 21% daily value. The amount of vitamin C can meet the need of 56% daily value. The amount of calcium can meet the need of 3% daily value. The amount of iron can meet the need of 4% of daily value. There are quite a number of health benefits that have been established as a result of many studies. Here are some of the health benefits you get apart from the low calories in yellow squash. Powerful Antioxidant. 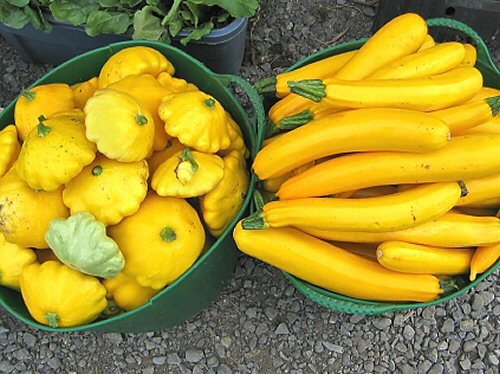 Yellow squash is a great source of manganese, vitamin C, lutein, zeaxanthin and carotenoids. These antioxidants are necessary for the health of your eyes. They protect against cataracts and macular degeneration. Regulation of Blood Sugar. Yellow squash is rich in B-complex vitamins, which are used to control blood sugar levels in the body. It contains B3, B2, B1, B6, folate and choline. It also contains magnesium, zinc and omega 3 fatty acids, which play a role in blood sugar metabolism. Anti-Inflammatory Benefits. The presence of anti-inflammatory carotenoids such as zeaxanthin, beta-carotene and lutein, the presence of omega 3 fatty acids, and the presence of homogalacturonan (anti-inflammatory polysaccharides) make yellow squash an excellent anti-inflammatory. Antimicrobial Protection. The vegetable has strong anti-parasitic properties that make it a very effective anti-microbial. It is used for the treatment of tapeworms and other parasites in some parts of the world. Prostate Health. Men with prostate cancer experience an unusual and frequent urge to urinate. This can be controlled with the help of the yellow squash seeds. Cancer Fighting. The anti-inflammatory and antioxidant properties of yellow squash make it a logical option for anti-cancer benefits. If you’re wondering how to make the yellow squash so that you can get most of the health benefits and still have a scrumptious meal, here’s a recipe. Mince the garlic, dice the onion and cut the cherry or tomatoes in half. Cut off both ends of the yellow squash and the cut them into halves or fourths lengthwise. Heat 2 tsp. olive oil in a large frying pan and throw in the onions. Let them sauté for about 3 minutes to allow them to soften. Add garlic and allow to sauté for one more minute. Add the squash pieces and some more olive oil if needed. Cook over medium heat for 8 minutes while turning every now and then. Make sure the squash is well cooked and has started to brown but is still crisp. Stir in the tomato halves and let them cook for about one minute. Season with black pepper and salt. Sprinkle Parmesan and serve the meal immediately.